. 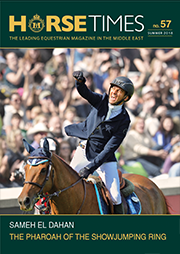 :: YOUNG SYRIAN RIDER AHMAD SABER HAMCHO IN FIRST GCT WIN ::. 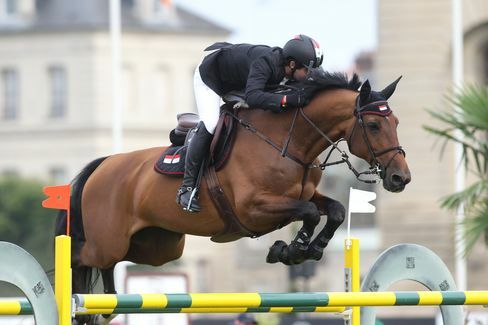 Nineteen-year-old Syrian rider Ahmad Saber Hamcho kicked off GCT Chantilly with his first win in the world’s most prestigious show jumping series. The young rider looked determined from the start as he entered the huge grass arena on his 14-year-old mare Columbia. He took a very tight turn, tighter than all the other riders, to the replica Chateau fence, and after clearing the tricky double towards the end, Hamcho really accelerated over the last two fences to a winning time of 32.99. Italian Luca Moneta and American rider McLain Ward were second and third respectively with only a fraction of a second between them on 35.87 and 35.92. The Prix ESN class was in two phases with rides who go clear in the first phase, racing against the clock in the second. The course designed by Uliano Vezzani included some troublesome fences with light rails that fell at the slightest touch. Many of the top ranked riders took sweeping turns on the vast showground and paid the price with time penalties. The bogey fence ended up being the horseshoe double combination. It followed the replica chateau obstacle and the downward slope to the double left riders like Christian Ahlmann, Ben Maher and Rolf-Göran Bengtsson on 4 faults.